Review of Mastery, the latest book by Robert Greene on how to master work, life and everything else. 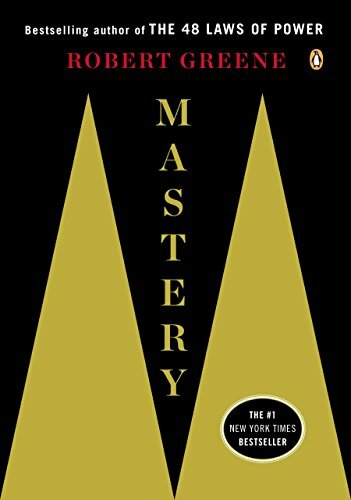 Mastery by Robert Greene is his most recent book on what it takes to become a master in any given subject or skill. Following the success of The 48 Laws of Power, The Art of Seduction, The 33 Strategies of War and The 50th Law, Mastery lays out the path to achieve master status. The path to mastery is a difficult one. In typical Greene style, he draws on his vast knowledge of history referencing people in the past who aspired to and achieved mastery status. People like Leonardo da Vinci, Benjamin Franklin, Michael Faraday and Charles Darwin to name a few. He also draws on who he calls contemporary masters from the modern world including the anthropologist, Daniel Everett; boxing trainer, Freddie Roach and others from the realms of neuroscience, computer engineering and robotics. This is the second of Greene’s books I’ve read so far. The first one being The 48 Laws of Power reviewed on this blog a few months ago. Is Mastery is a good as the classic 48 Laws of Power? Mastery is about transformation. It’s about moving from one level of intelligence to another which kills old ideas and perspectives to make way for the new. Sometimes mastery is fleeting. During moments of pressure where the correct answer or solution seems to come from the ether. For people who have mastered their craft, it is a way of life. Always present ready to use when required. Greene says there is a simple process or path to mastery which is accessible to all. Provided, of course, we are willing to put in the time, dedication, sacrifice and the ups and downs of learning new to become a master. Greene suggests that we live in a climate where someone who dedicates their self to a vocation is in a sense looked down upon. The hedonistic culture sees it as a bore when in reality people who seek mastery for the greater good are the ones who are helping with the survival and prosperity of the human race. The path to mastery is the overall premise of the book and each step is broken down into chapters. Greene says what we lack most in the modern world is a larger purpose to our lives. We live in increasingly secular societies and where once religion was provided purpose they now do not. This lack of purpose, Greene says, affects people in all kinds of ways even if they aren’t conscious of it. To achieve mastery you have to find your vocation. Greene advises to think back to your childhood and ponder your motivations as a child. This, he says, is your calling before parents, friends, peers, school and work took over. In increasingly saturated markets Greene says to find a niche that you can dominate. It requires patience and strategy. Go into a field that corresponds with your interests and niche yourself from there. One must first have an apprenticeship to reach mastery. If you’re beginning in a new field then this usually means starting at the bottom. During this time you will feel frustration because your brain has yet to develop the neural connections between skillsets. Greene says there are eight steps in the ideal apprenticeship. Having a mentor starts with humility and understanding there are people who know much more about a subject than you do. Some people (and I include myself here) often feel that submitting to an authority figure is somehow degrading. In reality, this is just pride which you have to overcome if you want to become a master. The problem is, as people age the inclination to seek a mentor becomes less so. Greene says having a mentor can turn ten years of self-mastery into five years. Not through shortcuts but by streamlining the process and by ensuring you don’t waste time in wrong areas of study. A mentor should push you into the abyss. Get you uncomfortable and give you self-doubt. It’s during these times that the learning and growth happens. And when you think you’ve learnt everything you have to set yourself a new challenge and start again. Greene makes the point that toughness and constant connection to a reality are both requirements to achieve mastery. Self-help books, he says, promise too much for too little when in reality a lot of work has to go into make lasting change. Mentors develop mastery through the toughness and constant connection to reality. “Masters are those who by nature have suffered to get to where they are. They have experienced endless criticisms of their work, doubts about their progress, setbacks along the way. They know deep in their bones what is required to the creative phase and beyond. Greene advocates working directly with a mentor instead of using books and other materials. This isn’t always feasible, as it wasn’t for Thomas Edison, in which case you must be diligent in your study. What separates humans from other animals is our social intelligence and our ability to sense what others are thinking and feeling. Humans take longer that other species to become independent from their mother. According to Greene, this greater social bond between mother and child makes us more naive about how the world works. This is what he calls the Naive Perspective and to achieve mastery we must go beyond this to understand other people’s underlying motives. Not in anger or not with emotion but with supreme acceptance. Specific knowledge of human nature: the ability to read people and understand how they see the world. General knowledge of human nature: understanding the patterns of human behaviour, including the darker qualities we often disregard. These traits are usually disguised because they are so abhorrent but they lay in waiting, deep down, should cause for them arise. Greene says be wary of these realities in people you interact with. Greene also provides advice on how to have more social intelligence. He says to speak through your work; craft the appropriate persona; see yourself as others see you and suffer fools gladly. Greene says we have two minds. The Conventional Mind and the Original Mind. The Conventional Mind is the mind which develops over the years through experience and the pressure to conform to society. The Original Mind is the type of mind we have as children, when everything seems new and interesting, and before we settle into a more fixed mindset. This is what drives the creative force within us. Masters, Greene says, retain a sizeable portion of their childhood spirit despite the pressures and demands of adulthood. What kills the creative force is not age or a lack of talent, but our own spirit, our own attitude. We become too comfortable with the knowledge we have gained in our apprenticeships. We prefer to live with familiar ideas and habits of thinking, but we pay a steep price for this: our minds go dead from the lack of challenge and novelty. The final step to achieving mastery is through fusing the intuitive with the rational. Through years of working in or studying a particular subject, masters come to understand all elements on a deep and unconscious level. This high level of intuition is the ultimate form of mastery. Intuition is developed through following rational thinking. The two work together and it is the master’s depth of knowledge along with their analytical thinking what creates intuition. This final stage of mastery does not come without its barriers and setbacks but, as Greene says, this is part of the process. We should endeavour to learn new skills related to our job, vocation, hobby or general life. If you’re not learning new skills and getting out of your comfort zone your worldview becomes smaller each year. I’ve always been a do-it-yourself kind of guy and used secondary sources like books and the internet to develop my skills. In hindsight, I should have tried to find mentors to work with. Some masters don’t achieve mastery status well into an older age because the process takes time. It ain’t over until it’s over. Mastery is another masterpiece by Greene that will stand the test of time. The historical references and the in-depth research that go into each one of Greene’s books will keep it selling for years to come. The first half of the book, for me, seemed to be the most interesting. It took me a few days to read it but towards the end, I was beginning to lose focus. Partly to do with my reading fatigue but also to do with the book drawing out some sections to long to make a point. If you want to understand what it takes to become a master of a subject then there is no better book than this one. It may make you realise that you don’t have what it takes to become a master because you’re not prepared for the long process, self-doubt, drudgery and so on. Or, it may inspire and confirm that you are on the right path in your chosen field and you’re willing to do whatever it takes. Like The 48 Laws, Mastery is a book I’ll often refer to. I usually buy the Kindle version first and buy a paperback version if the book is special. In this case, I went straight to the paperback because anything from Greene is a keeper. If you liked this review of Mastery, The 48 Laws of Power review can be found here.